Lectures 3. The Decline of Poland. 1 Factors commonly listed and why they do not explain the decline. In most textbooks on European history, Poland's decline is usually attributed to the following factors: (a) the elective monarchy; (b) the breakdown of the parliamentary system due to the "Liberum Veto" (means: "I am free to veto,", or the right of any one deputy to veto resolutions, which led to the dissolution of the Seym, that is, the parliament); * (c) the "greed and selfishness of the Polish magnates (great landowners). Sometimes a fourth factor is added: [d] the miserable condition of most of the peasants. *[Note: Polish national parliaments - made up of nobles and higher clergy as elsewhere in Europe - began meeting in 1463 and passed laws by unanimous consent. Unanimity was also enforced by the nobles in the medieval parliaments of Spain. The Tudor monarchs in England managed to secure the necessary votes in the House of Commons by offering various rewards, or threatening reprisals. because they had the funds to do so. Modern French and Spanish monarchs had enough wealth to rule without parliaments. The basic assumptions underlying unanimous consent were: (i) the issue was so good, or so worthy, that it could not allow a dissenting group vote. (ii) each nobleman's vote was equal to another's, so a majority vote would discriminate against the minority. The rule of unanimity survives today in the requirement of a unanimous decision in murder trials in British and U.S. courts of law]. Of course, the factors listed above contributed to Poland's decline, but they do not address the roots of the problem. To begin with the last factor (d), serfdom existed at this time all over E. Europe, but it did not weaken Prussia, Austria, and Russia, so it cannot be counted as a factor in the decline of Poland. The first factor, (a) the Elective Monarchy, that is the election of Kings by all nobles assembled in a field outside Warsaw, was certainly disruptive. The first such election took place in 1572 after the death of last male of the Jagiellonian dynasty, when the nobles elected Henry Valois of France, who had to recognize the rights of the Polish nobles, that is: (a) recognize all existing noble rights; (b) agree to do nothing without the consent of the nobles in parliament, and (c) sanction religious toleration for Protestants in both Poland and in France. (Henry soon left to ascend the French throne.) Royal elections were not always for individual candidates; thus the Vasa dynasty had three elected Polish kings between 1587 and 1672, while two rulers of Saxony, father and son, were elected Kings in 1697 and 1733. 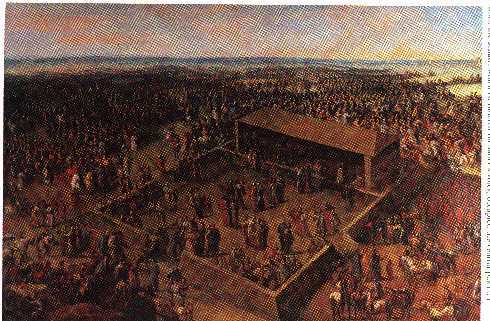 Royal Election at Wola near Warsaw, 1572. (from: A PANORAMA OF POLISH HISTORY, Warsaw, 1982). The second factor (b) the Liberum Veto was certainly disruptive, but Polish parliaments managed without it for almost 200 years, for it was first used in 1652. It should be noted that both at that time and later, the L.V. did not invalidate the laws passed before a deputy exercised his right to cast it. Deputies who opposed the measures passed, or could not get their bills passed, could also form "Confederations," which used majority rule. These confederations could be, and often were, armed groups of deputies who tried to get their ends by force. They were also disruptive, but not as disruptive as the 15th and 17th century civil wars in England. The third factor, (c) the greed of the great magnates certainly existed. * They were greedy and selfish in looking after their own interests. However, this was true of great magnates in other countries. We should also bear in mind that modern national consciousness, and thus the primacy of what is good for the nation, did not develop until the 19th century. Therefore, to blame the magnates for being greedy, and thus unpatriotic before the 19th century, is to use a standard of political behavior that was not prevalent anywhere at the time. So what were the real reasons for Poland's decline? In this author's view the two key factors were: (1) Insufficient crown revenues after 1572 (end of Jagiellon dynasty and beginning of a series of wars), and then the bankruptcy of the Polish crown due mainly to wars; (2) the rise of absolutist military powers to the East, West, North and South of Poland, which took advantage of Polish weakness. These two factors were intertwined. (1) To begin with, we should note that even before the wars began, the revenues of the Polish crown were inadequate for its expenses, which was also the case in many other countries. The Polish crown owned royal lands from which it was supposed to draw most of its income. However, by 1600, many of them had come into the hands of the nobles by dint of long-term lease, or as rewards for service. Other basic sources of income were the tax on the "lan," a unit of arable land held to cover the cost of one soldier; the beer tax, and the chimney tax. However, the nobles were exempt from taxe. They provided military service, fighting themselves and equipping their men in what was called "the general movement." But this, in turn, was an unreliable military force because the nobles would leave to look after their estates, whether the war was over or not. * Thus, the crown came to rely on mercenary troops, and these were expensive. Their pay was almost always in arrears. *[This was also the case in other countries. The first standing armie were established in the mid-17th century by Oliver Cromwell in England -but abolished after the restoration of the monarchy in 1660 - by Louis XIV in France, and by Frederick Wilhelm in Prussia. The Polish crown was bankrupted by a series of wars beginning in the late 1500s, but especially after 1648. Before discussing these, however, let us view Polish crown finances in a broad European context. As noted above, the 17th century Polish crown did not have adequate resources to fight wars, or even wield effective power, and the same was also true of many other countries. Here we should note that the English Civil War of 1640-49 broke out because parliament would not grant King Charles I money unless he granted their demands, which he refused to do. Of course, England had a great geographical advantage, the English Channel, which made foreign intervention very difficult if not impossible. After the Stuart restoration, English nobles got rid of the Catholic James II, brought over William of Orange and won control of the national purse strings in parliament in the "Glorious Revolution" of 1688. This began the decline of royal power in England. In English historiography, these nobles are not considered "selfish," although the main reason they made William of Orange King of England was because he was a Protestant and thus not likely to take back the old Catholic Church. lands confiscated during the Reformation and given by rulers over the years to the nobles of England. They feared that the Catholic James II would do just that. In other countries, such as the France of Louis XIV ( who ruled personally 1660-1715); the Prussia of the Great Elector Friedrich Wilhelm ( ruled 1640-88 - Elector because he had the right to participate in the election of the Holy Roman Emperor) and his descendants; the rulers of the Austrian Habsburg Empire; the Spanish Habsburgs; and the Russian Tsars, the crown had enough funds to crush noble opposition in assemblies or parliaments. Louis XIV gave subsidies to the Prussian Elector, in order that the latter fight the Habsburgs, but Friedrich Wilhelm used the money to build up a standing army without the need to consult his nobles in parliament, so they lost power. The Spanish Habsburgs had gold reserves from their overseas Empire, which enabled them to expand and wield absolute power at home, as did the rulers of Portugal and its Empire. The Austrian Habsburgs borrowed money from bankers, and so did the Kings of Sweden, so both fought their European wars on credit. The Russian Tsars, who were also heads of the Orthodox Church, could give and confiscate noble property at will. They took care of military expenses mostly by conquering new lands. Louis XIV of France was not so fortunate after the first few years of his personal rule. He impoverished the crown by his wars (1667-1714), which allowed the French nobles to raise demands for power sharing. This opposition, which, under the influence of the "Enlightenment" argued for the rights of man and citizen, came to a head in 1789, when the French crown was bankrupted by supporting the American War of Independence. As we know, the French Revolution of 1789-97 opened a new era of European and world history by overthrowing the old feudal order, though this was, in fact, on its last legs in most of western Europe. Polish kings did not have gold, land, or wealthy bankers at their service. By the mid-1600s money, and thus power, had passed into the hands of the Magnates (Great Noble landowners) who used their patronage over the middle and lower nobles (gentry), to disrupt parliaments so as to prevent the passing of laws contrary to their interests. By the 18th century, the Magnates , as well as the middle rank nobles of Poland, could be compared in their ownership of land, slave labor, living style, manners, code of honor and political-economic-social beliefs, to southern plantation owners prior to the Civil War. By the last decade of the 1600s, some also accepted money for electing foreign kings. Now let us look at the wars that Poland fought after the end of the Jagiellonian dynasty. They not only bankrupted the already ailing crown, but also witnessed the rise of hostile powers around her. 2. The Wars and the Rise of Great Powers hostile to Poland. (1) The Wars with Russia. King Stephen Batory (or Bathory, a Hungarian magnate from Transylvania, married to the Jagiellonian princess Anne), was elected King after Henry of Valois left Poland. 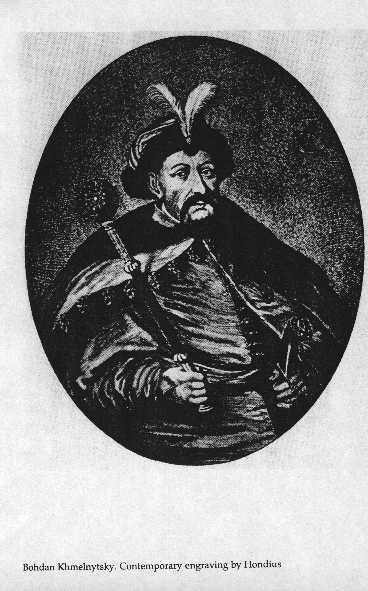 Batory ruled in 1574-86. He was a great military leader who defeated Ivan IV, the Terrible of Russia in the war over Livonia, 1579-82, sometimes called the First Northern War. (Livonia approximates modern Latvia). However, Batory failed to establish a dynasty. His successor was Sigismund III of the Catholic branch of the Swedish royal House of Vasa; he was the son of John III of Sweden and his wife Catherine Jagiellon. He was elected King of Poland in 1587 and ruled until his death in 1632. Sigismund III aimed to take the Swedish throne but the Swedes were Protestants, so war with Sweden ensued. However, Swedish expansion into the southern Baltic lands made war inevitable anyway. (See Swedish Wars below). He also wanted to gain the Russian throne, so he took advantage of the chaos in Russia after Ivan IV had killed his only son and there was a struggle for the succession. Various "pretenders" claimed the Russian throne, each one claiming to be Ivan's son who had miraculously survived. Sigismund III supported two pretenders one after the other, aiming to use them as puppets. His son, Wladyslaw IV (pron. Vwadeeslaf) was even offered the Russian throne by some Russian nobles in 1610, on condition he accepted the Orthodox faith. But his father refused his consent. Polish troops occupied the Kremlin in Moscow for a short while in 1612, but had to leave in early November in face of a national uprising. Poland intervened in Russia again in 1617-18. These Polish military expeditions created great Russian resentment and left bitter memories in Russian minds. (However, intervention in other countries, when in a state of chaos or unrest, was not uncommon in Europe). Here we should note that the Russian nobles elected Michael Romanov as Tsar in 1613, and the Romanov dynasty - though much watered down by foreign marriages - ruled Russia until the last Tsar, Nicholas II (ruled 1894-1917), abdicated the throne at the outset of the Russian Revolution in March 1917. (He and his family were murdered by the Bolsheviks in July 1918). (ii) The Cossack Wars, Ukraine, and the rise of the Russian Empire. the word cossack is derived from the Turkish word "qazaq" or freebooter. Cossacks were originally runaway serfs from central Muscovy and later also from Polish estates in Ukraine. They formed military communities of free fighting men, the most famous of which was Zaporozhye on the Dnieper river. They raided Turkish-controlled Crimea for booty, and some were employed by Polish Kings to fight the Crimean Tatars. These Tatars were subjects of the Ottoman Empire and carried out frequent raids into Polish territory, so Polish king hired the Cossacks to contain them. (from Orest Subtelny, UKRAINE. A History, Toronto, Buffalo, London, 1988). For this purpose, Polish Kings used "registered" cossacks who lived in towns or had landed estates. The problem was that the Kings did not have enough money to employ all the Cossacks willing to serve, nor to give regular pay to the "registered" Cossacks in Polish service, nor recognize their titles to land - so they were angry. Furthermore, those who had run way from Polish estates in Ukraine were Orthodox peasants; they hated Polish Catholic lords and their Jewish estate managers. Cossack revolts against Poland began in 1591, but the great revolt came in 1648. It was led by the Cossack Hetman (Commander-in-Chief) Bohdan Khmelnitsky (1595-1657), who wanted to establish his own kingdom. Khmelnitsky had suffered at the hands of a Polish neighbor and failed to obtain justice in Warsaw. He then decided to use the cossack masses for his own ends. The revolt began with a brutal "pogrom" (massacre) of Jews and Polish nobles in Kiev, though it is not clear whether Khmelnitsky ordered it, or whether he could not, or would not stop it. 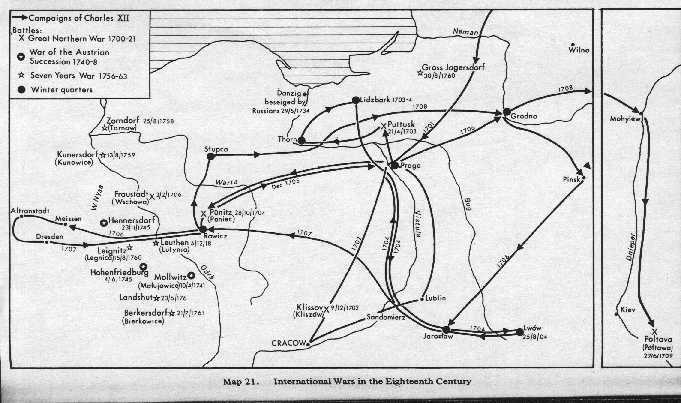 In any case, the cossacks defeated the Polish armies in two major battles and drove deep into Poland. Later, Khmelnitsky asked the Russian Tsar Alexis I for protection in 1654, thinking he could use the Russians to help him fight the Poles - but instead, he gave the Tsar a pretext to take over a large part of Ukraine. The Polish nobles tried belatedly to conciliate the Cossacks, offering them autonomy in a union with Poland. After Khmelnitsky's death, Ivan Vykhovsky (b.?- 1664) who had fought on the Polish side, became Hetman. He signed the Union of Hadiach (pron. 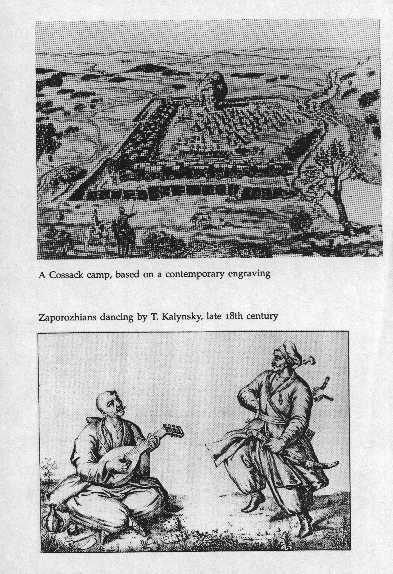 Khadzhyach) with Polish representatives on Sept.16, 1658.This would have given Ukraine the name of the Grand Duchy of Rus, and the same rights as Lithuania, creating a Polish-Lithuanian-Ukrainian Commonwealth. But the Orthdox-peasant Cossack masses hated the Catholic Polish lords, so they revolted against Vykhovsky who fled to Poland, and the Union was still born. This Cossack revolt led to a Polish-Russian War over Ukraine in which the Poles lost left bank (Dnieper) or east Ukraine to Russia by the Treaty of Andrusovo, 1667. The Russian Tsar Alexis I had used Khmelnitsky's 1654 request for protection as a pretext to annex eastern Ukraine, while western Ukraine stayed with Poland. The division of Ukraine between Poland and Russia interrupted the natural development of Ukrainian statehood, and thus also language, literature. The Treaty of Andrusovo, 1667, signaled the emergence of Russia as the pre-eminent power in Eastern Europe, replacing Poland. Note that Poland had already been greatly weakened by the Swedish Wars, especially the war of 1655-60. In the 19th century, Ukranian national consciousness developed mostly in western Ukraine. It was inspired by an idealized view of Khmelnitsky and the Cossacks. Its leaders' aim was to create a large Ukrainian state to unite all Ukrainians. The first of these wars broke out over Livonia in 1626. Sweden was now a strong Baltic power and was trying to extend its rule to the southern Baltic shores. At the same time, Sigismund III Vasa always hoped to gain the Swedish throne. After some Polish victories, an armistice was signed in 1629. The Swedes broke the armistice when they invaded Poland in 1655. This began a war often called "The Deluge" by Polish historians because of the multiple evils it brought on the country. The Swedish advance was supported by the great Polish-Lithuanian magnate, Janusz Radziwill (1612-1655, pron. Yanoosh Raadzeeveel), who signed a treaty uniting Lithuania with Sweden. The Swedish invasion forced Polish King Jan II Kazimierz Vasa(John II Casimir,1609-1672, King 1648-68) to seek refuge in Silesia. (from Norman Davies, God's Playground. A History of Poland. vol. I., The Origins to 1795, New York, 1982). The Swedes marched all over Poland, devastating the country. This led the Polish gentry (lesser nobles), as well as some peasants, to fight the Swedes. 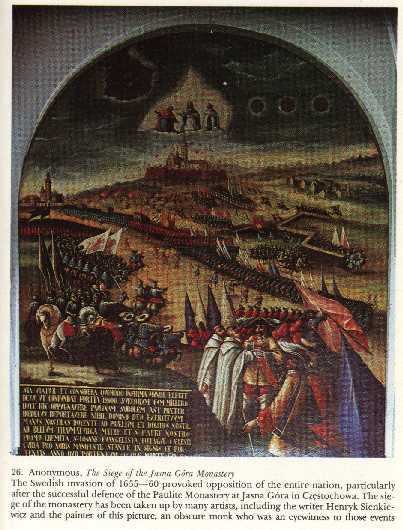 The turning point of the war was the successful Polish defense of the fortified Pauline monastery of Jasna Góra (pron. Yasnah Goorah = Shining Mountain) at Czestochowa (pron. Chenstokhovah) in 1655. The Polish victory - due to a combination of good Polish defense and the exhaustion of Swedish armies - was attributed to the miracle-working picture of Mary, the Mother of God and her child in the monastery church. King John Casimir proclaimed Mary "Queen of Poland," and Poles have prayed to her by that name ever since. The monastery is the chief religious shrine in Poland to this day. As the Poles were fighting the Swedes, Friedrich Wilhelm, the Great Elector of Prussia, threatened them in the north. By the Treaty of Oliva (pron. 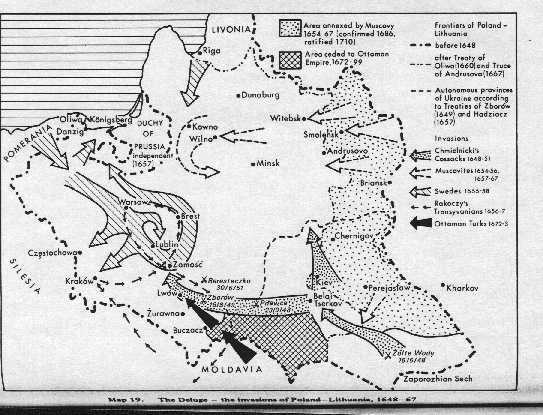 Oleevah), May 3, 1660, which ended the Polish-Swedish-Brandenburg Prussian War, Poland gave up her claim to Livonia while Jan Kazimierz gave up his claim to the Swedish throne. 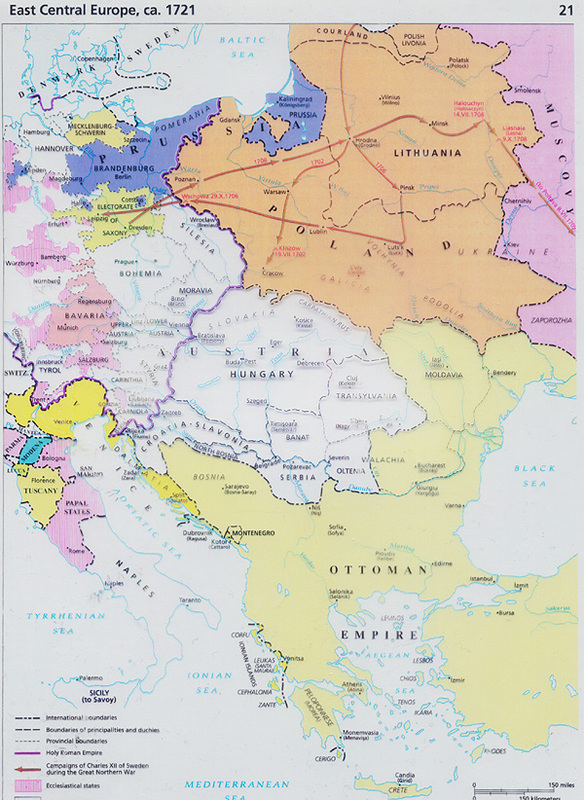 Most important of all, Brandenburg Prussia acquired sovereignty over East Prussia. This region had been under Polish sovereignty since the last Grand Master of the Teutonic Knights, Albrecht von Hohenzollern, had accepted the Lutheran faith and swore fealty to Poland in 1525. The Great Elector was also a Hohenzollern, though a distant relative. The Treaty of Oliva marked the first step in Prussian expansion Eastward at Poland's expense. From now on, a narrow strip of land, Polish Pomerania, divided Brandenburg Prussia from East Prussia, and this led Prussian rulers to desire the union of the two Prussias at Poland's expense. Only a small part of E. Prussia, called "Royal Prussia" remained with Poland, as did the port city of Danzig/Gdansk, but its grain trade declined greatly due to the 17th c. wars. Finally, religious toleration declined in Poland during the 17th century wars. The Swedes and Prussians were Lutherans, the Russians and Cossacks were Orthodox. Therefore, Polishness came to be identified with Catholicism, while other religions were suspect. The Swedish War of 1655-1660 devastated much of Poland, especially the towns. It was accompanied by a flare up of the Black Death. (which progressed West and cost many lives there). As a result of war damage, famine, and the plague, Poland-Lithuania is estimated to have lost between one third and half of its population, which was about 11,000,000 in 1650, before the war started. The country recovered to some extent by 1700, but then came the Great Northern War, 1700-1721, in which Swedish and Russian armies devastated Poland again. (See under: Saxon Kings, below). Polish wars with the Ottoman Turks lasted on and off for about two centuries. However, after the Battle of Mohacs, 1523, when the Hungarian armies led by Louis Jagiellon, then King of Bohemia and Hungary, were defeated by the Turks, most of the fighting was with the Crimean Tatars, subjects of the Ottoman Empire. In 1674, a Polish noble, Jan (pron. Yan) Sobieski (1629-1696), was elected as King Jan III, mostly because of his military victory over the Turks at Chocim (pron. Khotseem), in 1674. Nine years later, Sobieski marched with a Polish army to the relief of Vienna, besieged by the Turks, and Polish winged hussars played a major role in defeating the Turkish army there on 12 September 1683. Sobieski had hoped that one of his children would marry into the Habsburg family, but the Habsburgs were not interested. Though Sobieski had many children with his French wife Marie-Casimiere d'Arquien - whom he loved to distraction, and to whom he wrote wonderful love letters - he failed to establish a dynasty. One of his grand-daughters, Maria, married James II Stuart, "The Old Pretender. " Bonnie Prince Charlie who led the Scottish revolt of 1745, had a Polish mother and is said to have known the language. 3. The Saxon Kings, 1697-1763. An important factor in the later decline of Poland were the Saxon Kings, the first of whom involved Poland in the Great Northern War, 1700-21. The first King elected with foreign money was Duke Augustus, Elector of Saxony (Elector meant he had the right to vote in the election of the Holy Roman Emperor). He was elected with money from the rulers of Austria, Prussia and Russia, to counter the French candidate, the Duke of Conti, who was elected by the majority of Polish nobles. The supporters of Augustus conducted another "election" and had him crowned in Cracow (P.Krakow) as King of Poland, Augustus II in mid-September 1697. He ruled until his death in 1733, when he was succeeded by son, who ruled as Augustus III, with brief interruptions until his death in 1763. Augustus II was nicknamed "Augustus the Strong" because of his great physical strength and his many illegitimate children (a portrait is in the Nelson Gallery, Kansas City, MO), but he was not equally strong in political-military judgment. He sided with Peter the Great of Russia (ruled 1682-1725),against Charles XII  of Sweden (ruled 1697-1718) because he wanted to gain Livonia for his son. Thus, he embroiled Poland in another long war: the Great Northern War, when Poland was devastated again. In 1704, Charles XII obtained the election of a Polish noble, Stanislaw Leszczynski ( pron. Leshchynskee, 1677-1766) as King of Poland to counter Augustus II. However, when Peter the Great defeated Charles XII at Poltava (Ukraine) on July 8 1709, Augustus II regained the Polish throne. More wars in map below. Leszczynski reappeared again as King of Poland, this time elected by most Polish nobles and backed by France, in 1733-35, during the War of the Polish Succession (a war actually fought in the west between France and Austria). By this time, Leszczynski's daughter had married King Louis XV  of France (who ruled personally 1723-74). Louis XV wanted French influence to counter Habsburg Austria in Poland. However, Leszczynski did not get any French military help, so he was forced to flee back to France, where he lived until his death as the Prince of Lorraine. He wrote political works attacking the Liberum Veto and advocating the abolition of serfdom. II. Polish Reform Projects and their Failure. There had been proposals to reform the Polish political system as far back as the 16th century, especially those of Andrzej Frycz-Modrzewski (1503-1572, pron: Andzhey Frych-Modzhevskee). He advocated equal citizenship for all Poles, the democratization of the state and the church, and a centralized though not absolute monarchy. However. these ideas were greatly ahead of their time, not only in Poland but in all of Europe. Concrete projects to refom the Polish state were proposed from the mid-1700s onward by members of the Czartoryski (pron. Chartoryskee) family of great magnates known as "The Family." They wanted to replace the Liberum Veto with majority rule in parliament and replace the Elective Monarchy with a hereditary crown, which they hoped would go to one of them. At first, the Czartoryskis looked to the Austrian Habsburgs for support, mainly because of the Austrian rulers' dislike of the Saxon Electors, also their distrust of Russia and their enmity to Prussia. However, France was the enemy of Austria, so it opposed the Czartoryski projects by supporting a rival magnate family, the Potockis (pron. Pototskees). The Czartoryskis then looked to Russia, assuming her rulers would wish to have a strong Poland as an ally. However, the Russian rulers preferred to have a weak Poland which they could control. Therefore, Catherine II the Great ( b. 1729 as a German princess, married Peter II, ruled 1762-1796) agreed with Frederick II the Great of Prussia (ruled 1740-1786) to support the candidacy of Stanislas Augustus Poniatowski ( pron. 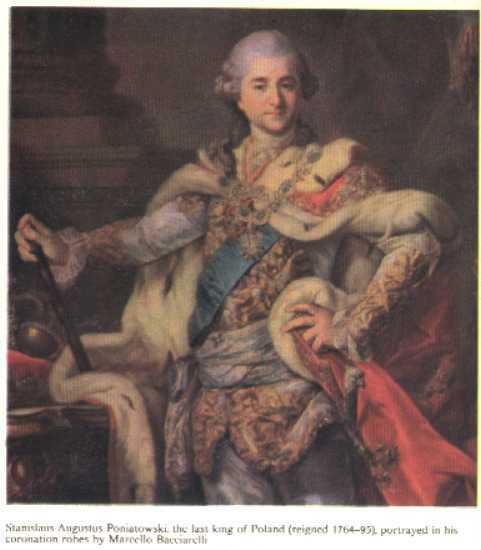 Ponyatofskee, Polish: Stanislaw August, 1732-1798) as King of Poland. He was elected King with Russian support in September 1764. He had been a lover of the young Catherine before she became Empress, and she assumed that he would be obedient to her. At the time of his election, Catherine and Frederick agreed to "guarantee the Polish Constitution,"which meant the ramshackle Polish political system. They agreed to do so, because they both wanted a weak Poland: Frederick aimed to seize part of western Poland, while Catherine wanted to control the country through the King. However, Stanislas Augustus disappointed them both. He was a well educated man with enlightened ideas, who wanted to reform the Polish system of government. He helped establish government commissions for the Army and the Finances. These were really departments which worked by majority rule. Catherine II and Frederick II opposed these reforms. Russian troops surrounded the Polish Seym (Parliament) in 1768, which Catherine forced to confirm the Liberum Veto and the Elective Monarchy. Furthermore, the Seym was forced to accept non-Catholic deputies. This meant German Lutherans who were loyal to Prussia, as well as orthodox Ukrainian and Belorussian nobles who were loyal to Russia. Catherine was praised by some in western Europe for religious toleration, but this was a move to control the Poles in their parliament. A group of Polish nobles and gentry rebelled against these measures. They formed the Confederation of Bar (a town then in S.E. Poland, now in western Ukraine), to fight for the Catholic faith and Polish independence. Their war with Russia spilled over into Turkish territory and led to a Russo-Turkish War, which gave the Poles some breathing space. Lecture Notes. 4. The Partitions of Poland. 1. The First Partition, 1772. The end of the Russo-Turkish War freed Catherine II to move against Poland. The First Partition, carried out in 1772, was the result of 3 factors: (a) the territorial ambitions of Frederick II and Catherine II; (b) The Austrian Empress Maria Theresa's (ruled 1740-80) decision to seize part of Poland to balance the expansion of Russia and Prussia; and (c)Polish military weakness. However, it is unlikely that even a strong Polish army could have defeated any two, let alone all three powers, at the same time. At best, it might have postponed or reduced territorial losses for a time. For Catherine II, the decisive factor against allowing a weak Poland to continue to exist with all her territories under Russian oversight was the state of the Russian imperial treasury, which had been emptied by the Russo-Turkish war. Therefore, she eyed part of eastern Poland and agreed to the proposals of Frederick II who wanted to seize Polish Pomerania for Brandenburg Prussia, thus uniting the latter with East Prussia. The Austrian Empress, Maria Theresa, who had already taken a small bite of Poland (Zips) decided to seize southern Poland, which she called "Galicia-Lodomeria," claiming it on the grounds that it had once belonged to the Hungarian crown. (In fact, it had been claimed by Hungarian kings in the 12th and 13th centuries, but ruled in name only by Lazslo [Louis] the Great of Hungary, 1370-82). Thus, by a secret partition treaty signed by the three rulers on Feb. 6 1772, the three powers seized about 28% of Polish territory. Russia took the largest piece: eastern Livonia, and and part of today's Belorussia; Austria took "Galicia-Lodomeria;" Prussia acquired Polish Pomerania and Warmia ( pron. Varmya, German: Ermland), but not Danzig (Polish: Gdansk), which the Prussians took in 1793. On September 18, 1773, the Polish Seym, surrounded by Russian troops, approved the loss of these Polish lands. 2. The Era of Revival and Reform, 1772-1793. King Stanislas Augustus, together with some enlightened Polish nobles and churchmen, pressed for reform of the government in order to strengthen Poland and preserve its independence. They were much influenced by the ideas of the "Enlightenment" as developed in western Europe, particularly in France. The King had spent some time in France and England as a young man. He was impressed by the English system of government, that is, constitutional monarchy. The men who exercised the greatest influence on the King, his advisers, and other reform minded Poles were three well educated, enlightened, Catholic churchmen and one layman: (1) Hugo Kollataj (pron. Kohwontay,1750-1812) a Piarist, but an enlightened thinker; Stanislaw Konarski ( 1700-1773 pron. Konarskee ), a priest and well known educator, who died in 1773 but provided a blueprint for the educational reform that followed ; and (3) Stanislaw Staszic (pron. 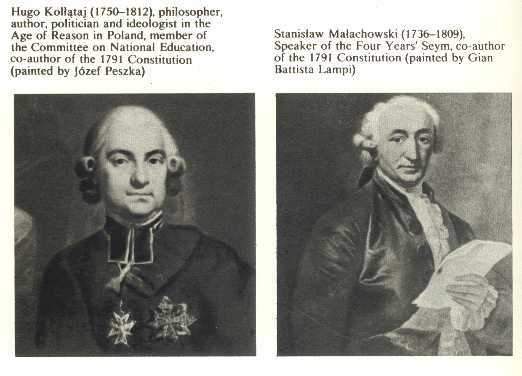 Stashyts, 1755-1825 ), a learned clergyman; and (4) Stanislaw Malachowski, who was to be the co-author with the King of the Polish Constitution of May 3 1791. All of them wanted to reform the Polish political system. They worked out plans with the King in the years 1775-89, when the country was governed by a Russian-inspired "Permanent Council," under the watchful eye of the Russian ambassador. Catherine II had imposed the Council to control the King and his officials. However, the Council helped to order and strengthen the central administration, though it was hated as a Russian imposition. Reforms began with education. The National Commission of Education was established in 1773. The reformers used the landed wealth of the recently abolished Jesuit Order, and many of the teachers were former Jesuits. As the first Ministry of Education in Europe, it followed the lines of educational reform established by Konarski in his Collegium Nobilium or College of Nobles, founded in Warsaw in 1740. The curriculum included not only Latin and Greek, the staples of the old system, but also modern languages, geography, history and mathematics. Much was published at this time on the need to reform the Polish political system. Ideas were discussed and reforms worked out in the "Four Year Parliament," which sat in the years 1788-1792. It proclaimed itself a "Confederation," so it worked by majority vote. One important reform was passed on March 24, 1791; this was the Law on Dietines (provincial parliaments; the name comes from the Latin "die" = day). It deprived about 50% of the landless gentry of their right to vote, and thus deprived the magnates of the ability to manipulate voting in local assemblies, electing deputies to the central parliament, and voting for the election of a King. On April 4, the Parliament passed the Law on Cities, giving rights to burghers in Royal Cities. The deputies' work culminated in the Constitution of May 3, 1791,drafted by the King himself and co-authored by St.Malachowski. It was the first written constitution in Europe to be voted by a parliament. True, it was voted in the absence of most of the opposition, who did not know of the upcoming vote, so only 110 deputies were there out of 504. The vote was by acclamation: 100 for and 72 against. Despite the small number of deputies voting, it was approved later by large majorities in the Dietines, and became law on September 3, 1791. 1 The Elective Monarchy was abolished, and replaced by a Hereditary Monarchy Since Stanislas Augustus had no legal male heir, the crown was to go the Frederick Augustus, the Elector of Saxony (1750-1827). He was known as an enlightened ruler and was expected to have the support of Austria, ruled at that time by another enlightened monarch, Leopold II, who supported Polish reforms. 2. The Liberum Veto was abolished and replaced by majority rule. 3. A Constitutional Monarchy was established on the English model. Thus, the King was to rule with a Council (Cabinet), whose members were answerable to Parliament, and there was a constitutional separation of powers. 4. There was to be a standing army with appropriate funding. The King was to be commander-in-chief. 5. Royal cities * were granted their own municipal governments and could send deputies to parliament. 6. The Peasants were promised the protection of the law. This meant they could appeal their landlords' judgment to the royal courts. 7. The Catholic religion was proclaimed as the state religion. However, all religions had the right to exist, provided they did not call for the overthrow of the monarchy. [For excerpts See: Polish Constitution, 1791, in: Krystyna Olszer ed., For Your Freedom and Ours, pp.53-53]. Of course, the May 3 Constitution was not as radical as the French one of August 1791, which sanctioned the abolition of serfdom. (It had already been abolished in 1789 in face of the great peasant revolt that swept France). But serfdom was the rule all over Eastern Europe, and serf labor was the capital on most landed estates. Thus, if the constitution had abolished serfdom , this would have ruined most of the Polish nobility. (Here, we should bear in mind that the American Constitution did not abolish slavery, because this was opposed by the southern states). 2. The Second Partition, 1793. 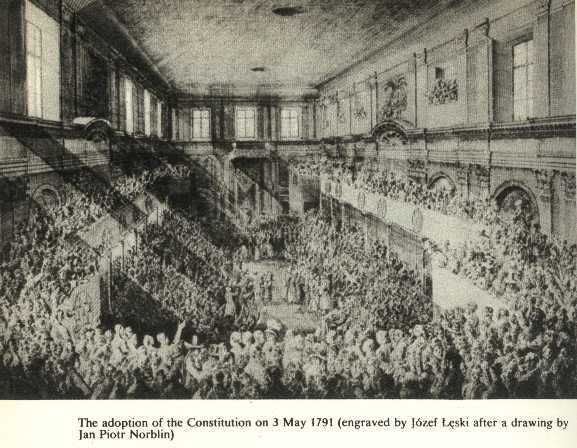 Russia and Prussia were frightened by the May 3 Constitution. They feared that if a strong Polish government came into being, it would try to regain the territories lost in 1772. Catherine II called the reformers "Jacobins," (French revolutionary radicals) and feared they would infect the Russian nobles. The enlightened Austrian Emperor Leopold II (ruled 1790-92) supported the Polish reforms, but he died in 1792. That year, Catherine the Great ended another Russo-Turkish war, so she could turn her attention to Poland. She found some Polish nobles who opposed the May 3 Constitution, fearing that it would lead to absolute royal power. They formed a Confederation in the town of Targowica ( pron: Targoveetsaa, now in western Ukraine). Their manifesto was printed in St. Petersburg, but they did not expect a second partition. Ever since then, Poles have called any Russian-supported Polish movement "Targowica." The Polish army put a good fight, but could not prevail against both the Russian and Prussian armies. The Austrians stayed out this time, hoping to get some German land, but failed to get it. The Prussians, who had, in 1772, taken Polish Pomerania (called the Polish Corridor by the Germans after it returned to Poland in 1919), besieged Danzig/Gdansk for seven weeks in 1793. The German-speaking burghers of this city resisted because they did not want to belong to Prussia, but were finally defeated. Prussia also took the city of Torun (G. Thorn), and annexed Wielkopolska ( pron. Vyelkopolskaa, Great Poland), which was now called South Prussia (later the Duchy of Posen, P. Poznan). Catherine II seized a very large piece of eastern Poland: most of Lithuania, western Belorussia, Volhynia, and most of Ukraine except for Eastern Galicia, taken by Austria in 1772. The Polish Seym was forced by the Russians to ratify the Second Partition in September 1793. King Stanislas Augustus accepted it, believing that such a step would at least save the existence of a rump Polish state with hopes of regaining some of the territory in the future. The Polish state now consisted of only one third of its pre-1772 territory. But the Poland partitioned in 1793 was no longer the country it had been in 1772. It had a modern constitution supported by most of the noble class. This constitution gave it a good central government, and a standing army, while it already had an excellent educational system. It was partitioned precisely because these reforms were meant to make it a strong state - which Russia and Prussia wanted to prevent. The Kosciuszko Uprising of 1794 and the Third Partition, 1795-97. 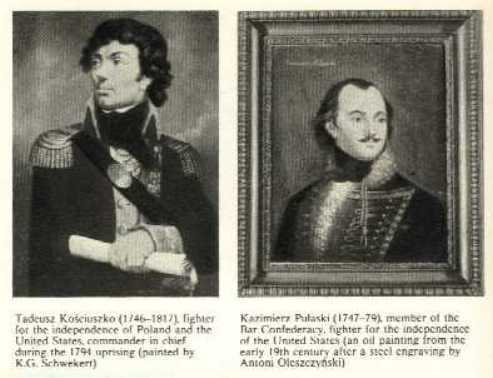 The other important Polish soldier on the American side was Kazimierz Pulaski (pron. Kazeemyezh Poolaskii, 1740-1779), who organized the first American cavalry unit. He died of wounds sustained in the Battle of Savannah. Polish Americans celebrate "Pulaski Day" with parades in early October every year, with the biggest parade in New York. Kosciuszko returned to Poland in 1784, much influenced by his experiences in America, especially American democratic ideas. He was appointed a Major General in the Polish army in 1789. Like many Poles, he refused to accept the abolition of the May 3 constitution and the second partition of Poland, and fought in the war against Russia in 1792. On March 14 1794, he took an oath "To the Polish Nation," in the market place in Krakow (pron. Kraakoof; English: Cracow). He very much hoped for French help, but revolutionary France was having a hard time to defend herself, so it was the Poles who indirectly helped the French by forcing the Russians and the Prussians to fight in them instead of revolutionary France. Meanwhile, Kosciuszko issued The Polaniec (pron.Pohlaanyets) Manifesto calling on all Poles to fight for their country. He promised land and freedom to the peasants who joined the Polish army. (See: K.Olszer, pp. 61-62). Though many had to stay behind to till the land, there were peasant infantry units in his army, who were armed with scythes attached to pikes. They were quite effective in some battles, especially at Raclawice (pron. Rahtslaveetseh), where they overran Russian artillery positions. Their weapon was a scythe fixed to the top of a long stave. It was effective a close quarters, but no match for massed infantry fire. The Polish forces were outnumbered by the Russians, who were joined by the Prussians. The Third Partition of Poland was carried out in 1795, though the final treaty was signed by the three partitioning powers, Russia, Austria and Prussia in St. Petersburg on January 27, 1797. 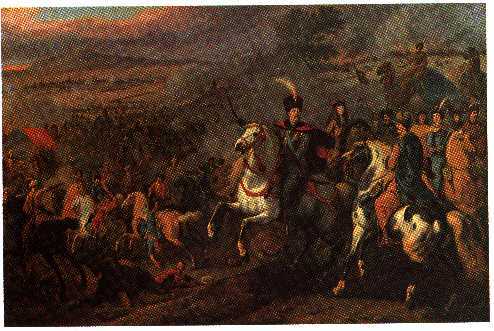 Kosciuszko was gravely wounded at the Battle of Maciejowice (pron. Matsyeyoveetseh) and was taken prisoner by the Russians. He was imprisoned with a few companions for two years in the Petropavlovsk Fortress, St. Petersburg. However, on the death of Catherine II the Great in 1796, he was released by Tsar Paul I (who hated his mother, ruled 1796-1801) on the promise that he would never fight against Russia again. Kosciuszko traveled through Sweden and England to America, where he was welcomed as a hero. He left in 1798 for France, hoping to secure French help for Poland. However, he was unsuccessful. Later, he refused to lead the Polish Legions in Napoleon's army. Indeed, he soon came to view Napoleon I (Emperor of the French, 1802-1815) as a dictator. After Napoleon's defeat, he refused the invitation of Tsar Alexander I (ruled 1801-1825) - who was also King of Poland - to live in the Kingdom of Poland (Congress Poland) created in 1815). Instead, Kosciuszko settled in Solothern (Fr. Soloure), Switzerland, where he died on October 15, 1817. (His house there is now a museum. There is also a Kosciuszko museum in Phildelphia, PA., U.S.A). Note: On sailing from America to Europe in 1798, Kosciuszko left a will, of which his friend Thomas Jefferson, was named the executor. In this will, Kosciuszko stipulated that after his death the property he had been given by Congress for his service in the War of Independence was to be used to free and educate black slaves. (He had freed his own slave). * However, the will was contested by his relatives, and finally very little if anything was left for the slaves. * [see: K.Olszer, pp. 63-63]. The Significance of the Third Partition of Poland. 1. It marked the disappearance of independent Poland from the map of Europe until November 1918. (However, there was a Kingdom of Poland, called Congress Poland, created at the Congress of Vienna, 1815; this was a small. theoretically autonomous state under the rule of Tsar Alexander I, then Nicholas I, as King of Poland. It existed for 15 years, until the Polish revolt against Russia, 1830-31. (See Lecture 5b). 2. It marked the beginning of the rise of Prussia as the strongest of the German states. The territories of former western Poland gave Prussia some rich agricultural land. During the Napoleonic Wars, Prussia lost her gains in the 3rd partition which included Warsaw, but recovered western Poland in 1815, see Lecture 5b). 3. Russia gained a firm foothold in Europe and became a European power. Also, after the Napoleonic invasion of 1812, Russian rulers and politicians, later Russian public opinion, considered the Polish lands as vital for the defense of the Russian Empire. 4. In 1795, Austria added some territory in central Poland to Galicia, which she had taken in 1772. However, after 1815 she held just Austrian Poland, that is, Galicia-Lodomeria. This province had poor agricultural land, but also two great cities Cracow (Krakow) in the West and Lwow (pron. Lvoof; Ukrainian name: L'viv (pron. Lveef) in the East. (The official name in Austrian times, was Lemberg). 5. The Third Partition cemented the alliance of the three partitioning powers, Russia, Austria and Prussia, which were bound together by their interest in keeping their Polish lands. Except for the interlude of the Napoleonic Wars, when Austria and Prussia were defeated by Napoleon I and had to obey him, the alliance of the three powers lasted until 1894 when Russia allied herself with France. A few years later, in 1907, Russia, France and Britain formed the "Triple Entente" against the Central Powers: Austria, Germany, and Italy, and this created the lineup for World War I. 6. King Stanislas Augustus * and the great magnates accepted the partitions, including the third one which wiped Poland off the map of Europe. However, many lesser Polish nobles refused to accept the loss of Polish independence and immediately began the fight to regain it, along with the lands of old Poland. This fight began with the formation of the lst Polish Legion in the French Army of Lombardy, Italy. Since any kind of independent Poland would mean territorial losses by the partitioning powers, the issue of Polish independence came to be known as "The Polish Question." The Constitution of 3 May 1791 continued to inspire generations of Poles until a new constitution was passed in reborn Poland in March 1921. Indeed, Lech Walesa (b. 1946) -who was to be the leader of the workers' movement "Solidarity" in 1980-81 and first President of independent Poland 1990-95 - illegally distributed leaflets with the text of the 1791 constitution in the 1970s as a gesture of defiance against the communist government of Poland. * Note on King Stanislas Augustus. He accepted Catherine's offer to pay off all his debts (mainly to architects, artists, and writers whom he patronized), and moved to Grodno (now in Belarus) where he abdicated the Polish throne in November 1795. He had hoped to live with a small court in Grodno, but Catherine forced him move to St. Petersburg. There, he lived the last three years of his life as a pensioner of hers, a sad figure forced to appear at court ceremonies and balls at her bidding, to be gawked at as a curiosity. He was buried there. The story of Stanislas Augustus' remains is also sad. His coffin suffered great damage in a 19th century St.Petersburg flood. In 1938, the Soviet government returned his remains to Poland, but the Polish government of the time decided not to have him buried with other kings at the Wawel (Pron. Vahvehl) Castle, Krakow, because he was considered to have disgraced the crown by agreeing to the partitions and living the last years of his life in St. Petersburg as a pensioner of Empress Catherine II. Therefore, he was quietly buried in his family church in eastern Poland. During World War II, his grave was plundered along with the church. Many years later, the tatters of the royal robe and a few other items were brought back to Warsaw, stored in the Royal Castle, and finally buried in the Church of Christ the Savior in the Polish capital. Polish historians and public opinion have always been divided on the place of Stanislas Augustus in Polish history. While most agreed that he did a great deal for Polish culture, especially the arts, and that he was a guiding light in drawing up the May 3 Constitution, many condemned his acceptance of the partitions and his status during his last years in Russia. Today, however, some historians point out that he accepted the first two partitions because he saw this as the only way of preserving the Polish state, and that he abdicated the throne after the third one. A recent English lang. biography is sympathetic to the King (See: Adam Zamoyski, The Last King of Poland, London, 1992, reprinted New York, 1997). See also Richard Butterwick, "The Enlightened Monarchy of Stanislaw August Poniatowski (1764-1795) in Richard Butterwick, ed., The Polish-Lithuanian Monarchy in European Context, c. 1500-1795), Houndmills, Basingstoke, Hampshire, England, and New York, 2001. (This book has contains interesting studies of the Polish monarchy in the period listed in the title). For an overview of the reform period, see: Daniel Stone, History of the Polish-Lithuanian State, pt.III. On 18th century Poland, especially the period 1772-1795, see: Samuel Fiszman, ed. Constitution and Reform in Eighteenth Century Poland. The Constitution of 3 May 1791, Indiana University Press, Bloomington, IN., 1997. The book - resulting from a conference held at Indiana University in October 1991 - contains 22 chapters by experts on many different topics. The concluding chapter is a comparison between the Polish "revolutions" of 1788-92 (the period of the Four year Seym and its reforms) and that of 1980-1990 (Solidarity, underground civic society, collapse of communism). Richard Butterworth, describes the English influence on Stanislas Augustus in his book, Poland's Last King and English Culture. 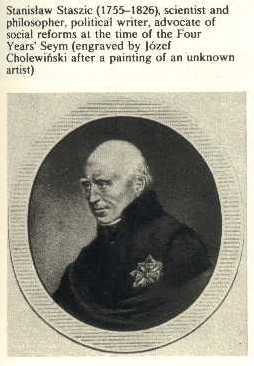 Stanislaw August Poniatowski 1732-1798, Oxford, 1998. Adam Zamoyski gives a sympathetic account of the King and his reign in: The Last King of Poland, Jonathan Cape, London, 1992; Hippocrene Books, New York, 1997 See also the same author: Treasures of a Polish King: Stanislaus Augustus as a Collector, London, Dulwich Picture Gallery, c. 1992. East European Monographis no. 289, Boulder, CO., and New York, 1990, pp. 168-177, 189-193. Jerzy Lukowski paints a rather dismal picture of the political, economic and social structure of 18th century Poland, including a chapter on the Polish Enlightenment, in his book, Liberty's Folly. The Polish-Lithuanian Commonwealth in the Eighteenth Century, Routledge, London, New York, 1991. He also has a short paperback on the Partitions of Poland, 1772, 1793, 1795, New York, Longman, 1999, and a chapter titled "The Szlachta and the Monarchy: Reflections on the Struggle inter maiestatem ac libertatem [majesty and liberty]," in Butterwick, ed., The Polish-Lithuanian Monarchy in European Context, pp. 132-149. He emphasises the elective monarchy as the greatest source of Polish ills, combined with the szlachta's distrust of the monarchy.